It’s the Burgundy hills that are called the “Hills of Gold”, and they too have just been listed on the World Heritage register, but those little vines blanketing the slopes of Champagne are no less valuable. 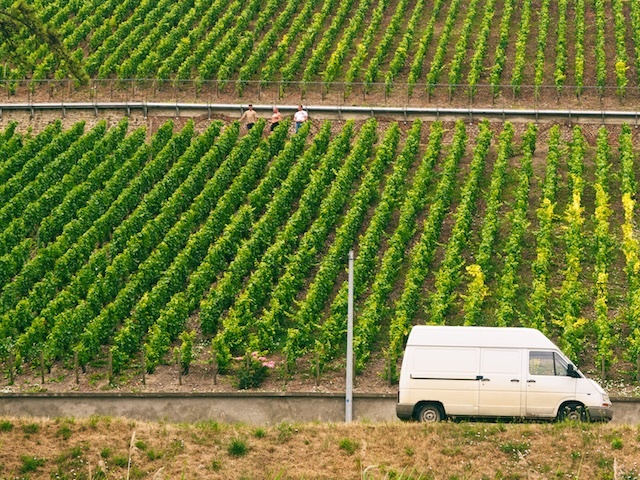 During our whistle-stop in Epernay, we learned from one small producer that times were not easy in the industry. He was the umpteenth generation in the business, and his children would have to pay sixty-five percent of the value of his holding in death taxes when he passed away, although while he didn’t mention the actual income from the place he did offer his concerns about how difficult it might be for them to find the money, when each hectare of grapes are worth more than two million Euros. He mustn’t have held any long-term concerns though, as went on proudly to talk about international distribution, and the languages his grand children are learning so that they will be equipped to deal in the future with the world’s leading currencies from China and Russia. We thought about hanging around for a bit, taking a tour perhaps to learn more of the industry so that we could sprout our knowledge at dinner parties, but the wanderlust that has gripped us for the past week or two overcame that thought, assisted admittedly by the cost which seemed to have been calculated on the same basis as death taxes, and we bade a silent farewell at last to the hilss of Champagne and the River Marne, promising ourselves that we'll return.